Co-founder of Sonder Connect talks about what it takes to strike balance – in life and at work. Few people exemplify balance more than Vaishali Kasture – an MD, Marathoner and Mentor, who champions leading a life of passion and fulfilment, that goes beyond the boardroom. As International Women’s Day approaches, we chatted with Kasture on what #BalanceforBetter means to her. Vaishali has been running for almost two decades now – a journey that led her to discover herself outside the boardroom, an experience she terms as “finding here third dimension”. But what keeps her motivated to run? “Running has been a great leveler for me. It is food for my soul and keeps me balanced as a person. We all need some “me-time” – time that we invest in ourselves, our thoughts and fitness. Besides making me healthier, it also puts things in perspective as it helps clear the mind. 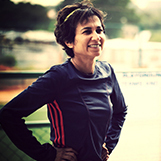 Despite her demanding career, Vaishali has made it as the fastest female veteran runner on the Indian Marathon Circuit, first amateur Indian woman to qualify for the prestigious Boston Marathon and the fastest Indian woman at The Comrades Ultra marathon. If you think you don’t have time to follow your interests, here’s a tip from Vaishali. “Like everything in life, you need to prioritize what is important to you and go after it, no matter what! I always take an hour out in the morning on weekdays and about 90 minutes on weekends for my workout/ run. Inadvertently, I am an early riser and get to sleep by 10 pm. My friends and colleagues know my lifestyle and plan evenings with me accordingly. Vaishali’s journey has been an inspiration for many people to build a well-rounded life that goes beyond work. As someone who took a sabbatical from work at the peak of her career, Vaishali talks about how time off can help one find their “third dimension”. “You have to invest in yourself. You cannot let just work or home define you. You must invest time in finding out what is your passion. What gives you unbridled joy? And for that you must keep experimenting… even the journey itself can be very rewarding. I took up multiple hobbies until I found running or rather, running found me. The best advice I can give you is to embark on that journey of discovery and be open to new experiences. Because if you don’t, then you haven’t lived your best life. How do women leaders stand out? What qualities do they exhibit? What strengths do they bring in? Vaishali draws on her own experience to explain what makes women great leaders. “In my years of experience, I have found that women are naturally more inclusive leaders. They are inclined to make the decision-making process more democratic, by getting more people involved, which is great to bring in different points of view. When it comes to gender bias, Vaishali strongly believes that maternity leaves top the list and that senior leaders can pay a big role in helping women speak up. “Gender parity is about ensuring equal men and women at all levels, right up to the boardroom, especially equal access to the corridors of power. And to do this, we must first work on unconscious biases, which are often seeped right into the culture and ethos of companies, such as discounting women after marriage or baby breaks. One of the biggest unconscious biases I see in the work place is the maternity leave. Why not give 6 months of shared leave to both parents, that they can split between themselves? If we need to create an equal workplace, let it start with shared maternity-paternity leaves. Let’s call it baby leave. Having been a part of the corporate world for over two decades, Vaishali Kasture has not only achieved professional excellence, but has also made her ‘way of living’ an inspiration for others. Alongside pursuing and acing a demanding career, she explored her love for fitness and wellbeing, which she calls ‘finding your 3rd dimension’. In her sessions, she talks about investing in one’s passions and how to maintain work-life harmony. Vaishali started her career with Citibank, post which she worked with MPHASIS in Tokyo and Bridgewater Ltd. in Hong Kong. Next, she joined the giant that needs no introduction – Infosys – as the Head of Global Business Unit of Banking and Capital Markets. And then helped Butterfield Fulcrum, the world’s 5th largest independent hedge fund administer, set up the India office as well as conceptualise and execute the Global Operating Model, as the Director and COO (India).